Neuwied is a town in the north of the German state of Rhineland-Palatinate, capital of the District of Neuwied. 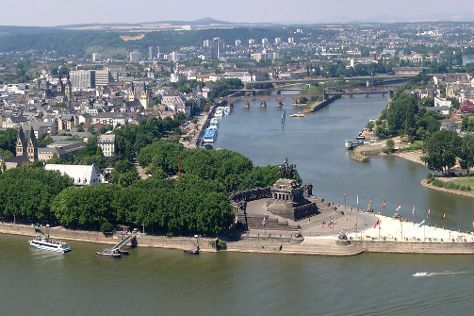 Neuwied lies on the east bank of the Rhine, 12 km northwest of Koblenz, on the railway from Frankfurt am Main to Cologne. The town has 13 suburban administrative districts: Heimbach-Weis, Gladbach, Engers, Oberbieber, Niederbieber, Torney, Segendorf, Altwied, Block, Irlich, Feldkirchen, Heddesdorf and Rodenbach. The largest is Heimbach-Weis, with approximately 8000 inhabitants.Founded by Count Frederick of Wied in 1653 as residence of the Lower County of Wied, Neuwied was located near the village of Langendorf, destroyed during the Thirty Years' War (1618–1648). It grew rapidly due to its religious tolerance. Among those who sought refuge here was a colony of Moravian Brethren.Near Neuwied, one of the largest Roman castra on the Rhine has been excavated by archeologists.In April 1797 the French, under General Louis Lazare Hoche, defeated the Austrians near Neuwied, this being their first decisive success in the French Revolutionary Wars.Neuwied is the native town of paternal ancestors of John D. Rockefeller, traced to the 16th century and possible French Huguenot refugees. His father's line emigrated to the North American colonies, arriving in New York in 1710, the year of a massive immigration of nearly 2800 Palatine Germans refugees, whose transportation costs from London were covered by Queen Anne's British government. Neuwied was also the birthplace of William of Wied, who briefly held the title of King of Albania in 1914. Neuwied is in Rhineland-Palatinate. When using our Germany trip planner to make an itinerary online, Neuwied holidays come together around your tastes, interests, and requirements, with us taking care of the logistics.